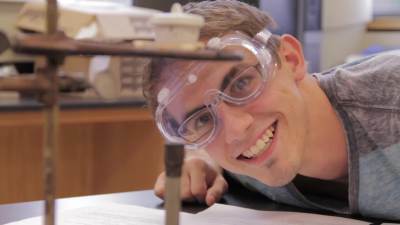 Learn about the Chemistry Major at JBU. Our motivation really for studying Chemistry is that we want to know God better. And we think that God has revealed Himself in his Creation. I do, also, find it interesting to figure what's going on at a very base level. All of the instrumentation that we have students can use. That's what it's there for. The labs are small, I'm with my friends, We're all trying to work together towards some goal of applying the things we hear about in lecture. We are small and so we get to know our students really well. There are so many opportunities, so many things you can do. Join us! It's so fun in here, you don't even know!